So, what have we been up to all summer? Nothing much! It rained all of June so that month was a waste. 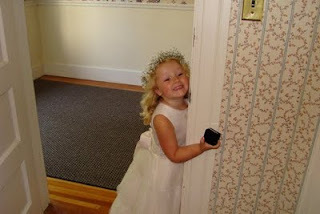 We enjoyed Cape Cod over the 4th which made a couple Wordless Wednesday posts. (Hey, it's WW again ... oh well). We also got to sneak in a camping trip which was wonderful. Oooh, so far, August is the winner! On August 3rd, I was diagnosed with Lyme Disease. Don't feel sorry for me; I have had no symptoms. The cure, however, may kill me! Doxycycline is NOT my friend. I have learned that besides being an evil, evil antibiotic, you can vomit and drive at the same time! 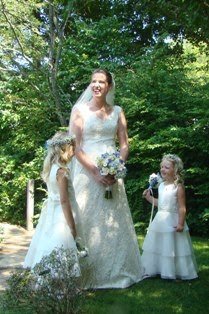 Then, last weekend, my girls participated in a friend's wedding as the flower girls. 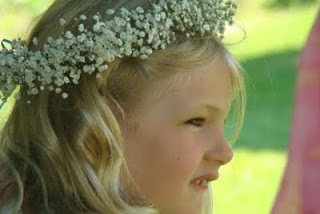 I can say with all honesty and no amount of subjectiveness that they are the quintessential flower girls. 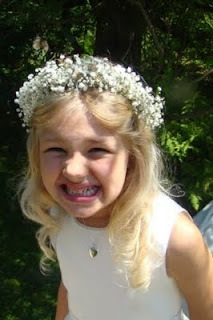 When you open a dictionary to look up "flower girl", their pictures should be there. So without further ado, here is their cuteness! And if you really want to cry, check out the professional pictures at Loving Eyes Photography. 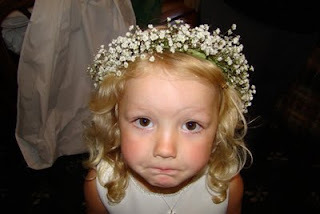 They are the picture of cute flower girls. Vomit while (shudder) driving?! I think this will haunt me for life. I thought vomiting while flying was horrible. aawwwwww! how cute are they!? pretty dang cute thats how cute. comment, comment, comment. I now officially left you some comments. I even put you on my fav list to read when i have the time.